When should you go hawk watching? Every day you can. The best conditions in the fall are when a clearing cold front arrives, often after several days of rain. The temperature drops, the skies clear, and it is crisp with a wind out of the north (NW/NE) for the next day or two. That creates the ideal conditions for migration. In the fall, you want winds somewhere out of the north, generally 10-25 mph. Southerly winds are not good, and hawks rarely move in numbers in rain. Each species has its own calendar of migration (see Hawkcount.org’s “Migration Timing” for the site you are considering, found under “Site Profile”). Broad-winged Hawks comprise up to 80% of all migrants inland Massachusetts, and 90% of them migrate through Massachusetts between Sept 10-24, along with Bald Eagles and Ospreys. If you go looking for Broadwings in October, you will see very few. Most Red-tailed and Red-shouldered Hawks, and the occasional Northern Goshawk and Golden Eagle migrate through from mid October to mid-November. You are likely to see the most hawks from Sept. 10-24. The diagram below shows by the thickness of its lines the relative size and timing of hawk migration through Massachusetts. It depends on the site (ridge, mountain, coastal) and the species you are looking to see. Thermal lift used by most species is best about 10 a.m. to 4 p.m. EDT, but when the birds pass by your site depends on where they were the day before and what the weather is like that day. We have had days when few hawks were seen from 9:00 a.m. to 1:30 p.m. despite ideal weather. One day we had 10,000 hawks pass by in the next three hours. You never know. There are days with good weather when you might see only a few hundred, sometimes quite distant even with binoculars. Every day is different. At Wachusett we expect maybe 5- 7 days with 100+ hawks per day and 2-3 days with 1000+ hawks a day. 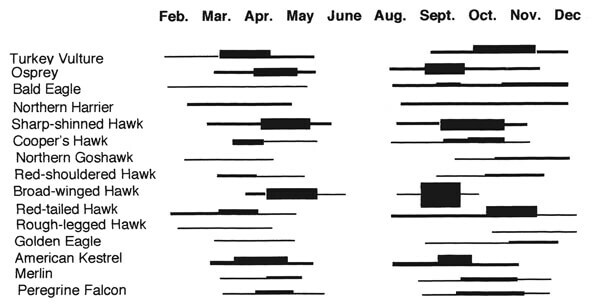 EMHW has had 9 days in 40+ years with flights of 10,000+ hawks (primarily Broadwings.) We have had over 25 days with 5,000+ hawks. Most of the state’s largest flights have been observed from Wachusett. Ridge fliers, including accipiters and falcons, often might be moving in modest numbers earlier and sometimes later in the day, especially along ridges like Mt. Watatic. While huge flights are incredibly spectacular, we’ve had many great days with fewer than 100 hawks. The views, the closeness of the birds, or seeing rare raptors extremely well makes many a hawk watcher’s day. This is especially true in spring hawk watching along the coast. With time, patience, good judgment, and a bit of luck, you can discover the unique rewards of hawk watching.